We first started working with the team behind Simple Steps Education in 2011 – before they even had a name for their company. The small but perfectly formed team of respiratory professionals approached us to assist in the creation of some educational tools for HCPs – helping to support clinical practice by making learning simple. This started with the design and artwork of ‘Inhaler Device Technique Reminder Cards’ – a set of cards that details how to use different inhaler devices in seven clear steps. 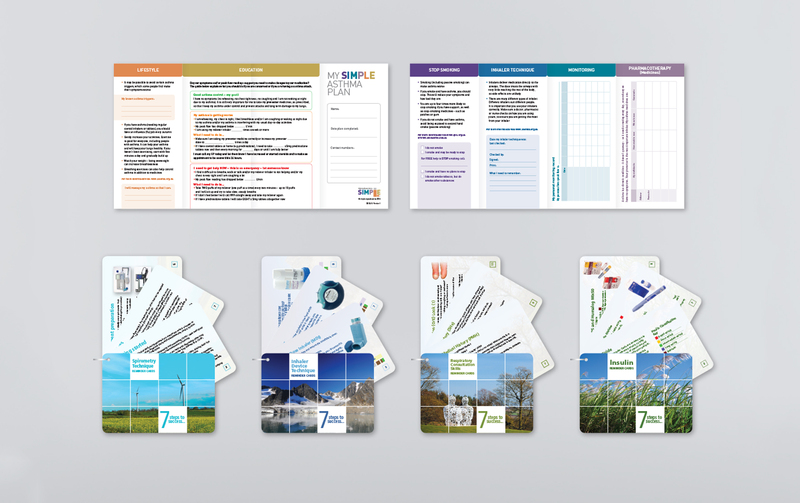 We continue to update this tool today and there are now three other card sets in the ‘7 steps to success’ series – Spirometry Technique Reminder Cards, Respiratory Consultation Skills Reminder Cards and Insulin Reminder Cards – each of which we have designed and print managed. We have also worked with the team to create a ‘My Simple Asthma Plan’ leaflet – a useful tool for patients.